When an elderly curator of precious bean seeds lost almost all of her harvest the future of the unique Crimson-flowered Broad Bean seemed doomed. Instead Miss Cutbush sent the last remaining seeds to the Henry Doubleday Research Association (HDRA) for their Heritage Seed Library (HSL). From just four seeds, which the library successfully propagated, the precious bean was saved. Now it is one of the most popular Broad beans in this unique Library, and is grown by thousands of gardeners across the UK. "Without HDRA's Heritage Seed Library (HSL), the Crimson-flowered Broad Bean would have disappeared, and many other varieties would be extinct. HSL is protecting the skills, knowledge and seed technology of our forefathers and is a model for similar work across the world," says Patrick Mulvany of ITDG, nominating the Heritage Seed Library for the UK Food Group WORLD FOOD AWARD. "HSL is a beacon of hope at a time when biotechnology companies are developing self-sterilising seeds which will prevent farmers and gardeners re-sowing them." The library was founded in 1978, when legislation designed for commercial growers started rapidly eroding the vegetable varieties available to UK gardeners. European legislation limits the varieties that can be legally sold and UK seed legislation demands varieties be registered, but at a cost. Gardeners wanting tasty, colourful and traditional varieties which ripen over a long period of time, are left with less exciting commercial varieties. By contrast these are designed to maximise yield and ripen uniformly. They have high water content, and there is little emphasis on flavour or appearance of the crop. Varieties such as Magnum Bonum (Champion of England) Peas, Ice Crystal Wax French Beans, Green Zebra Tomatoes or Belgian White Carrots cannot be sold or traded under restrictive European and UK legislation. Sales of any variety not on the official list are banned. HSL, however, has cleverly exploited a loophole in the law. By lending seeds to members it can protect traditional varieties, spreading their growth to gardens throughout the UK. Members can't buy or sell the seeds but they can 'borrow' them from the library. With 700 varieties of Heritage, delisted and 'illegal seeds' - the library is a genius method of protecting and enhancing diversity for UK gardens. 35,000 packets of seed are distributed each year to its 9000 members, and new "traditional" varieties are added every year. 250 gardeners known as Seed Guardians regenerate about 100 self-pollinating varieties every year. Cross-pollinated varieties are grown by HSL staff and contractors in order to ensure purity of regeneration. Up until now HSL has relied on the chance donation of seeds by people like Miss Cutbush, but recently the UK government's environment programme, through the Department for Environment Transport and the Regions (DETR), has agreed to fund a search for more varieties. So effective is the library that it may influence imminent changes in UK and European legislation to allow the sale of small quantities of so-called 'Heritage Varieties'. "With contamination of these precious varieties by genetically modified seeds now on the horizon, maybe the same legislation should also ban the cultivation of these 'Frankenstein Seeds'," PatrickMulvany, of ITDG, added. "The job this library does is invaluable to the richness of our food and our gardens and in maintaining varieties whose disease resistance and other characteristics may prove invaluable in the future. It ensures that this generation will not be the one to lose the technological wisdom of previous generations, sewn up in the diversity of its seeds. The world - and our kitchens - would be poorer without the tasty Heritage foods the library has saved from extinction." Sue Cooper - +44 1759 368 286; or Jagdish Patel - +44 171 523 2369. UK Food Group: More than twenty five of the UK's leading non-government food, development, environment, and agriculture agencies make up the UK Food Group. Working in different food-related areas, their common aim is global food security - good food available for all people. 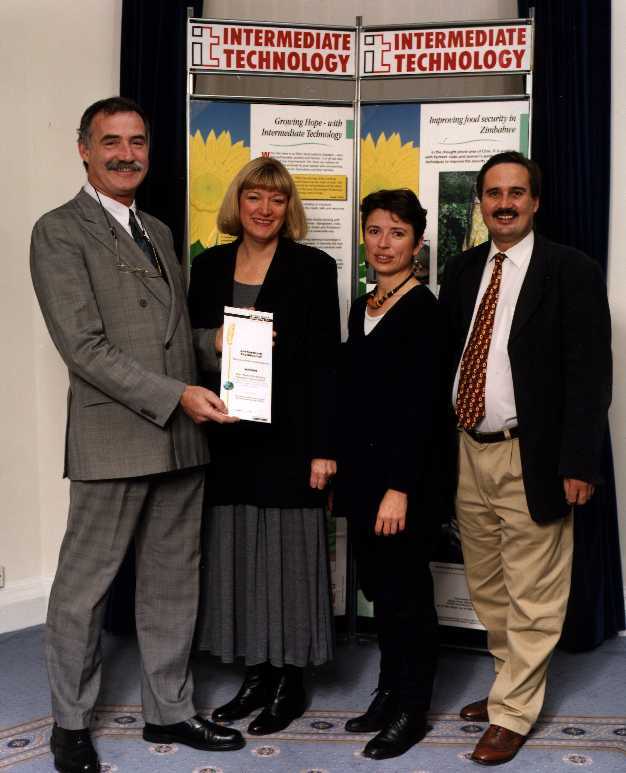 Embargo until 00.01hrs, 16th October 1998.
INTERNATIONAL DEVELOPMENT CHARITY PRESENTS WORLD FOOD AWARD. Food Award' to the Henry Doubleday Research Association (HDRA). of our forefathers and is a model for similar work across the world. gardeners re-sowing them" he said. legislation demands, at a cost, that varieties be registered. the seeds but they can `borrow' them from the Library. people feel about saving our genetic diversity".